Yeah that’s right. A-list. Ok fine, P-list. Anyway, IBBB was invited to the GQ Fashion Show and after-party at the Gansevoort Hotel in New York on Monday night. The GQ show was being hosted by Nigel Barker from America’s Next Top Model. Normally I wouldn’t care less, but now was my chance to achieve one of my life’s goals (as you know): Getting a picture with Tyra Banks in a headlock. Yes, one may dream. 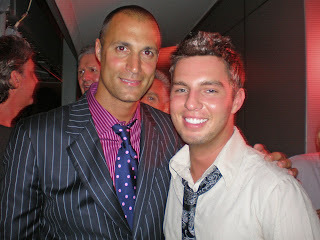 Sadly though Tyra wasn’t there, but that didn’t stop me from telling Nigel Barker about my dream. In more unfortunate news, Nigel did not think that was funny and to loosely quote him, “Huh? That isn’t funny.” Fine. One person nearby who did overhear that comment did laugh so it was a real win-win night for me. Other celebrity (yes singular) that was spotted at the fiesta was Sean-William-Scott (Stiffler from American Pie). There could have been other celebrities there, but I wasn’t focusing on them. I was focusing on hunting down both Tyra Banks and The Olsen Sluts. They can run, but they can’t hide. Fine, they can hide.